In Tampa Bay, many people seek ways to protect their houses without taking away from the appeal. Storm panels and plywood help keep your space intact, but are unattractive and cannot be left up year-round. Custom window shutters provide the perfect solution for residents looking to upgrade the safety and aesthetic of their home. Custom window shutters are crafted to serve as strong support during severe weather as well as an attractive feature of your house’s exterior. Once these shades go up, they stay up and function as a source of shade, privacy, and decoration. The durable panels are mounted to the outside of a frame in order to hold up in rough conditions. After the announcement of a hurricane watch in Tampa Bay, all you have to do is close and secure your shades to prepare your building for the storm. While some custom window shutters are made from wood, PVC, or other materials, hurricane-rated shades from Master Aluminum are crafted from 6063-T6 aluminum extrusions. These blinds are welded to ensure maximum strength and durability during intense outdoor conditions. In addition, we weld the blades to the frame to prevent the possibility of bowing in extreme winds. During a hurricane in Tampa Bay, wind speeds range anywhere from 74 to 156 miles per hour. In these conditions, debris, trash cans, and even heavy patio furniture become dangerous projectiles that smash through the glass and leave buildings vulnerable to interior damage. Not only can heavy rain waters cause harm, but the shattered glass is a hazard, and the open space leaves a possibility for even more flying objects to enter the home. With aluminum custom window shutters, this kind of damage is unlikely. Safety does not have to be unattractive. 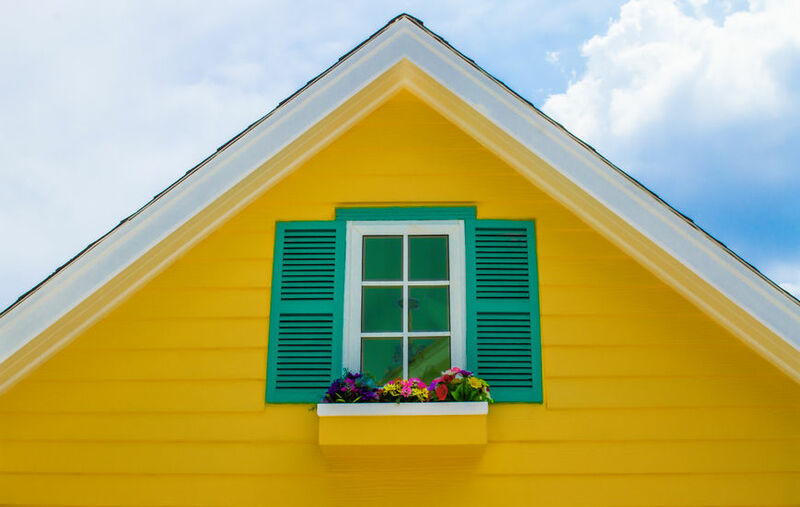 With Colonial-style custom window shutters, residents of Tampa Bay can give the outside of their homes a classic southern feel that looks great on almost any house. Traditionally, colonial style relates to houses with wood or brick facades, though any siding works. Many people who are looking to transform their exterior living space work with professionals to reface their homes for a more fluid design. These shades mount to the outer sides of panes, hinging out. Storm preparation is as simple as pulling the panels closed and securing them. With a safety solution ready for use at any moment, you have more time to focus on your family and other preparations. These custom window shutters give homes an island feel, which is perfect for homes in Tampa Bay. Many people give their entire living space a makeover with the installation of Bahama-style blinds. For the shades themselves, people may choose bright pastel shades, such as coral, seafoam, and teal. To achieve a Caribbean feel inside, switch to white linens and incorporate lots of exotic green houseplants that are easy to maintain. In addition, this style looks even better with wooden furniture. Pieces made from dark woods like mahogany or light bamboo are perfect additions to a Caribbean-style living space as well. Tie the whole house together with bright accents and floral patterns. Bahama-style blinds mount to the top of panes and hinge upwards, providing light and fresh air whenever you desire. As with Colonial style, storm readiness is as simple as pulling the shade closed and latching it shut. At Master Aluminum, we craft custom window shutters for residents and businesses across Tampa Bay. Because we specialize in Bahama and Colonial styles, we can focus on the design, quality, and superiority of our products. We weld our products to create secure, seamless, and smooth products that hold up in the harshest weather. In addition, our products receive a powder-coated finish to withstand harsh UV rays and deter rust. When you order from Master Aluminum, your items arrive installation-ready with a warranty lasting three, five, or seven years. Also, Master Aluminum is part of a quality assurance program through the National Accreditation and Management Institute. For shades that keep your home safe in Tampa Bay while adding to its appeal, trust Master Aluminum. For more information, visit us online or contact us at (727) 725-1744.